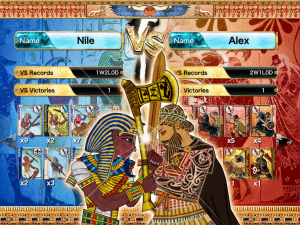 Take command of two ancient forces: the Egyptians and the Greeks. Extensive single-player campaign to conquer with the empire of your choosing. 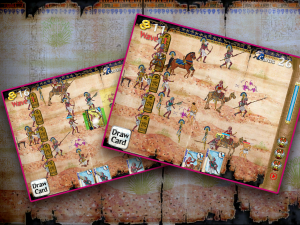 Two-player battles via Bluetooth® and WiFi. 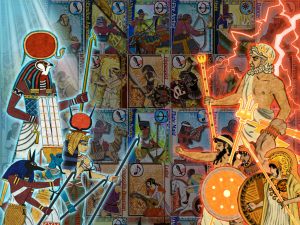 Over 120 cards to collect, ranging from lowly soldiers to mighty gods and mummies. A total of 170 stages (2 armies x 17 stages x 5 difficulties) available. 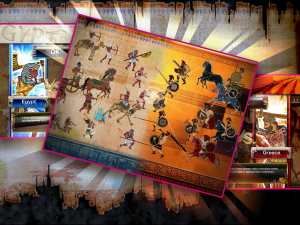 Colorful art style inspired by ancient hieroglyphics and Greek pottery. Utilize the king’s special technique to guide your clan to win! For press assets please visit www.sega-press.com. For more news, follow SEGA on Twitter @SEGA or “like” us on Facebook . 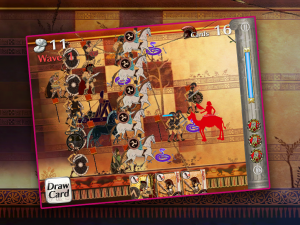 Erin Fan, TriplePoint for SEGA of America, Inc.
To see the ancient Egypt vs. Greece conflict in motion, check out the Alexandria Bloodshow launch trailer online!